We aimed to update the 2011 recommendations for the prevention and treatment of anticipatory nausea and vomiting in children and adults receiving chemotherapy. The original systematic literature search was updated. Randomized studies were included in the evidence to support this guideline if they as follows: were primary studies published in a journal in full text (i.e., abstracts, letters, book chapters, and dissertations were excluded); published in English; evaluated an intervention for the prevention or treatment of anticipatory nausea and vomiting; reported the proportion of patients experiencing complete control of anticipatory nausea and vomiting consistently and; included at least ten participants per study arm for comparative studies and at least ten participants overall for noncomparative studies. Eighty-eight new citations were identified. Of these, nine were brought to full-text screening; none met inclusion criteria. The guideline panel continues to recommend that anticipatory nausea and vomiting are best prevented through optimization of acute and delayed phase chemotherapy-induced nausea and vomiting control. Benzodiazepines and behavioral therapies, in particular progressive muscle relaxation training, systematic desensitization and hypnosis, continue to be recommended for the treatment of anticipatory nausea and vomiting. No new information regarding interventions aimed at treating or preventing ANV that met criteria for inclusion in this systematic review was identified. The 2015 MASCC recommendations affirm the content of the 2009 MASCC recommendations for the prevention and treatment of anticipatory nausea and vomiting. 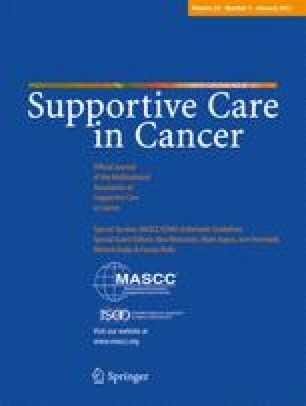 The MASCC Anticipatory Nausea and Vomiting Guideline Development Panel is grateful to the Pediatric Oncology Group of Ontario (POGO) for granting permission to update the literature search undertaken for the Guideline for the Prevention and Treatment of Anticipatory Nausea and Vomiting Due to Chemotherapy in Pediatric Cancer Patients. The guidance of Dr. P.D. Robinson with respect to clinical practice guideline methods is acknowledged with thanks. The assistance of Ms. Mila Khanna is also gratefully acknowledged. Disclosures: M. Aapro has received support from Helsinn; Tesaro; MSD Merck, and Roche. L.L. Dupuis has participated in research partially supported by Sea-Band Ltd. A. Molassiotis has received honoraria and support from MSD Merck; Helsinn; Tesaro; Norgine; and Acacia Pharma. I. Olver has received support from Tesaro. J. Roscoe has no disclosures to declare.